Come relax, rejuvenate and reflect. Enjoy the Japanese Soaking Tub, a ritual practiced in Japan for centuries. Unlike a bath for cleansing, it is a relaxing, meditative experience, used to calm the spirit and restore vitality. The soaking tub enables you to sit upright with water reaching your upper chest or neck. This is an ultimate spa experience (spa = partaking in healing waters). ~ A cleansing shower proceeds your soak. ~ Soaking in the tub can incorporate aromatherapy essential oils, sea salt or bath salts (additional charge). Enjoy the healthy waters of Morgan Coulee Prairie. Untreated with chlorine or chemicals, the water is naturally rich in minerals. ~ A 20 minute soaking time is recommended (45 minute scheduled session). ~ The soaking tub can accommodate one or two people - tub is 3' x 3' with 2 benches. ~ Follow or precede your soak with a massage session. Massage options include: Relaxation massage, Energy Therapy. *Add Aromatherapy, mineral salts, herbs or sea salts for an additional $13.00. Mineral Bath Salts - choose a blend of mineral salts and essential oils from EO (essential oil company in California) or an EarthSky blend of salts and aromatherapy. Herbal Bath - infuse your bath with a tea of fresh herbs/summer, dried herbs/winter. Sea Salt - 6 cups of salt detoxify and soothe sore muscles. You can schedule a day visit or incorporate your services into a your overnight stay at Journey Inn or the Cottage at Journey Inn. Your soaking time can precede or succeed a bodywork session. During the past 30 years Charlene has been a practitioner of massage & energy therapy. Because of the healing potential and enhancing qualities of essential oils she has added them to the treatments she offers. Enjoying making seasonal aromatherapy massage oil blends as well as scented bath salts, perfumes and room sprays, she has taught women to make their own signature blends during Women's Retreat she offers once or twice annually. She believes that using the oils of herbs, flower, trees and roots helps us gain a deeper connection to the natural world, helbing balance body, mind, emotions and spirit. 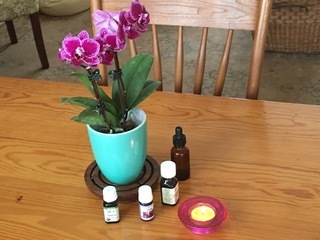 Before creating aromatherapy blends participants will watch a beautiful video about the history of aromatherapy, and discover how essential oils where used for healing and enhancing personal environments since ancient times. Guests will learn the basics of the essential oil categories and how to blend - Top, Middle and Base notes. Choosing from a large collection of oils, guests will create their own signature blend (or follow one of many recipes provided). Following the blending process participants will be guided through simple massage, acupressure and energy therapy techniques integrated with application of the signature oil blend. Additionally, instructions will be provided on making sprays, bath salts and creams. Blending class will be held in Journey Inn's large Center Room area. This class can accommodate 4-8 people, so gather together your small group and call the Inn to schedule your lodging and blending class. Cost is $50 per person for the 1 1/2 hour class. Call/email for more information or to schedule your getaway. 715-448-2424 or info@journeyinn.net. Essential oils and bottles of carrier oil are provided. Kristina, E-RYT 500 and Certified Vedic Chant Teacher, teaches yoga and chant within the tradition of T. Krishnamacharya and T.K.V. Desikachar, a respected lineage of yoga that honors the needs and capacities of each individual and is based upon traditional yoga philosophies. This one-on-one instruction is based entirely upon your individual needs, capabilities and personal goals. It can help the healing process or reduce symptoms associated with injuries or illnesses. A variety of yoga techniques may be experienced within private sessions...including physical postures, breath work, meditation, visualization, discussion of yogic concepts/philosophy and sound. The yogic approach to health and healing is intrinsically holistic, taking into account the entire human system...including the body, breath, mind, behavior and emotions. As an added benefit, a home-based practice is written and provided as a visual aid for you. Private Session Rates: $140 for 1.5 hours. Longer sessions available - please inquire. This session can also be for a couple that has a similar yoga experience background (or both beginners). Yoga of Earth: Come dwell within the qualities of stability and security created by connecting your energy to that of the Earth. In this practice, we will focus on grounding and rooting the body to provide a firm foundation. Stabilizing yoga postures, relaxing breath work, visualization and meditation will provide the framework for this grounding experience. Yoga of Water: Let yourself flow into change and embrace the natural movement of life by allowing the qualities of the Water to guide your journey. In this practice, we will use gentle fluid movements coupled with cooling breath patterns and visualization to help release energetic blockages and to encourage the flow of your innate creative and healing energies. Yoga of Fire: Support your ‘inner fire’ and fan the flames of transformation with this invigorating practice. Sun salutations and creative movement patterns that support purification and inner change will be the fuel for this class. In addition, breath practices and visualizations that enhance the qualities of light and clarity will balance this energizing experience. Yoga of Air: Open the heart to self-care and kindness through gentle expansive movements and restorative poses in this soothing class. In addition, breath patterns and guided meditation will be woven into the practice to help guide the senses inward and calm the mind, bringing you to a place of balance and ease. $120.00 for a 1.25 hour class with 4-6 participants. Larger groups, with up to 12 participants (additional fees) will be available at Santosha Springs Center in Maiden Rock coming late summer, early autumn. The Yoga Nidra Journey is a guided meditation that will take you to a state of deep relaxation. After setting an intention there is nothing to do but follow the verbal guidance of the instructor. This practice allows you to surrender your busy mind and tight body. Resetting the nervous system in this way reminds you of what a comfortable, relaxed state feels like. Yoga Nidra is helpful for insomnia, anxiety, depression and PTSD. Energy Therapist, Charlene Torchia, teaches you and your partner to connect on the subtle, as well as the physical level, with touch. Learn acupressure, massage and energy balancing techniques to calm your spirits and enliven your relationship. Using these techniques on a regular basis will increase your communication, connection and enjoyment. $95 for 60 minutes, $145 for 90 minutes, includes handouts. This practice can be done on a massage table or in a chair. Journey Inn is home to a 7-circuit Labyrinth which has been mowed into a large meadow. Surrounded by hills, trees and sky this quiet, private setting is conducive to tuning in and listening to your inner guidance. The ritual begins with intention setting and/or creating a question statement. As you walk the Labyrinth into the center you can focus your mind by meditating on your intention or question. Upon reaching the center you will call upon the energies of Air, Fire, Water and Earth to create a sacred space and open to receive guidance from your Mind, Spirit, Emotions & Body. As you wind your way out of the center, deep listening can reveal insights or paths of action. Begin and follow up with a writing exercise. $25 individual, $45 group, $65 walking and ritual with facilitator. The labyrinth is available for all guests to walk whenever desired during your stay. Learn the practice of meditation, a method of working with the mind that will contribute to the restoration of your mind, body and emotions to optimal health. John will teach you how and will give you a personalized practice to take home.